“Feasting and Fasting” … sounds like some of my diet plans! 🙂 … however, it’s not a diet plan. It’s an approach to your spiritual journey I’d like to suggest you consider for this season of Lent. “Feasting” on God’s Word, and “Fasting” for spiritual growth and closeness to the Lord. In this article, I will give you some tools and ideas for each. 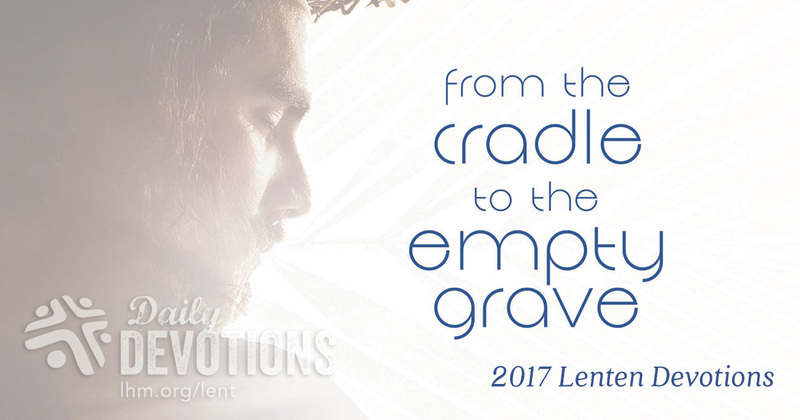 The season of Lent is one of thoughtful reflection. During this time of the church calendar, Christians ponder the unfolding events that led to Jesus’ condemnation and crucifixion: His triumphal march into Jerusalem on Palm Sunday; His firm words of warning about the events to come; His sham trial, brutal scourging, and horrific crucifixion. No day could be any darker; no travesty more calamitous than the slaying of God’s own Beloved Son. And yet, that’s what we find on Golgotha: our sins demanding His death on a cross to satisfy the Father’s righteous judgment. Taken from the cross, the lifeless form of Christ was placed in another man’s tomb. With that action the world thought the ordeal complete, the savagery it had witnessed something it could now put behind it. But God’s work wasn’t quite done. Three days later, out of a sealed tomb—guarded to prevent theft—Jesus rose from the dead. And with that thunderous crescendo, mankind’s disgrace and ruin, which had destined it for eternal slaughter, is forgiven through the blood of Christ. Lent is when we turn our eyes to the cross. It is there where Jesus, the sinless Son of God, suffered the indignity and shame of dying for our sins. And it is there where God’s wrath was satisfied by His Beloved Son’s supreme sacrifice, winning salvation for all who call Him their Savior. I’d like to suggest that you Feast on God’s Word each day as you let the Scriptures walk you with Jesus as He goes to the cross. Lutheran Hour Ministries makes a great daily devotional available for free. It’s called “from the cradle to the empty grave.” You can read it online, get it in your email, listen to it as a podcast, or get it on your phone in the free phone app. Just visit www.LHM.org/lent/. Fasting is a spiritual discipline that has been practiced for centuries. In the Bible we learn that it was practiced by prophets, kings and apostles. Many significant Biblical characters were blessed by God through fasting – Moses, David, Elijah, Nehemiah, Ester, Daniel and Paul, for example. Even our Lord Jesus used fasting as a way to draw closer to the Father while He was being tempted by the devil in the desert (see Matthew 4). What is fasting? But first, what is it not? Fasting is not a diet program. If you need to lose weight, a fast is not the way to do it. Fasting is not for personal glory; it’s something that’s between you and God. In fact, Jesus spoke out against those who drew attention to themselves when they were fasting. So what is fasting? A simple definition of fasting is abstaining from something for spiritual purposes. Usually it’s food that we forgo when fasting, but really anything that we give our attention to is something that could be removed in order to create more room for God in your life. When you fast, your desire is to draw closer to God and to ask God to reveal himself to you. Sometimes our lives get so full of the blessings of God, that we crowd out the One that is doing the blessing – God Himself. Sometimes we have so much going on that if God wanted to speak to us there is so much noise and so much activity in our life that we couldn’t hear Him if He said something to us. Remember, God often speaks in a whisper (1 Kings 19:12). The purpose of fasting is to increase your awareness of and dependence upon God. So, how might you fast this Lent? One way is to simply give up something that you frequently crave, but is non-essential. Chocolate is a popular choice since, contrary to popular belief, you don’t need chocolate to live! Every time you forgo the pleasure of chocolate, it reminds you of Christ’s sacrifice for you and allows you to depend on God to get you through that craving. All our cravings are something that only God can satisfy anyway. You might give up something that is sapping your available time – television, video games or surfing the internet. Consider spending the time that you free up, not with some other distracting activity, but with family, or doing devotions, or enjoying God’s creation while meditating on His greatness! There are many ways you can fast. This year, I am going to encourage you to join me in doing a simple “juice fast.” It’s a light fast and an easy way to start if you’ve never fasted before, yet it has the spiritual benefits of drawing closer to the Lord through abstaining from something. How you do a juice fast is to simply skip a meal or two and replace that meal with some liquid or juice. This will help you to keep your energy up (diabetics and others, please consult your physician if you have any concerns about this diet change) but it still represents a sacrifice. I suggest doing this fast each week during Lent. For example: have a good meal for dinner on Tuesday, then have juices for breakfast and lunch on Wednesday, breaking your fast with dinner (perhaps soup supper at church?) on Wednesday. That’s a 24-hour juice fast! Considering the challenging Spiritual work that our congregation is doing in preparing to reach many in our community with the Gospel, shouldn’t we draw close to the Lord through fasting and prayer? And won’t we each individually benefit from the time spent seeking the Lord? Let’s do what we hear spoken of in Scripture, but seldom do – fast and pray. Feasting and Fasting … May they strengthen your faith and draw you nearer to Jesus as He draws nearer to the cross.